1) a shooting guard for the Illini basketball team. Bruce Weber probably never envisioned something like this happening to his squad, but with the recent events of the past year in the rear view mirror, it has become apparent that the Illini are sorely missing a perimeter shooter that can hit the mark consistently. Trent Meacham seems to be the most accurate these days, but perhaps the best shooter on the team is not even playing this season. Jamar Smith, who is suspended for the 2007-08 season for his actions in a traffic accident back in February, continues to shoot lights out in practice, but cannot take that marksmanship into game action. Chester Frazier is in a funk this season, and the shots that he does take are not good percentage ones. Help is on the way, though, as Alex Legion, who transferred to Illinois from Kentucky early this week, will become eligible for spring semester of 2009. Yes, that's a year away, but the Illini will also have Smith back by then (if all goes well), and hopefully the woes that have befallen Illinois in the past few games will be a distant memory. 2) a Rose Bowl victory for the Illini football team. I would like to lift a glass of egg nog in honor of Ron Zook, and the transformation that he has given the football program since his arrival in 2005. Sure, the road has been a rough one, but the players on the team persevered and kept the future down the road in their view, and now that time has come. The Fighting Illini are Pasadena bound, and by the time you read this blog entry, should have landed in sunny Southern California and will begin preparing for what amounts to the biggest game in most of these players' lives. Zook is a mastermind from a recruiting standpoint, and he keeps bringing players into the program, now able to pick and choose from a stellar list of prospects. With this team having come so far in just a short time, what else is there to wish for? Maybe a national championship in 2008? that's another good reason to check them out. 4) an NCAA tournament bid for both basketball teams this year. Normally this isn't an issue with the men's team, but for reasons previously discussed, this season nothing is a given. The Big Ten is down this year, and the clear cut favorites are Michigan State and Indiana. After that, it's anyone's guess as to how it will play out. The Illini finally got that marquee win, a 59-58 win over Missouri in the Braggin' Rights Game in St. Louis last Saturday, their eighth straight in the series. However, they have some clunkers on their resume too, namely a loss to Miami of Ohio last week at the Assembly Hall. For the men to get in, they will have to get it done within the conference. As for the women, they are in much better shape, and if they keep their noses clean in Big Ten play, an invite on selection Monday should be forthcoming. There, that about covers it, doesn't it? Not too much to ask, don't you think? I hope everyone got what they wanted for Christmas, and we'll see you in 2008! the confidence that they are being worth followed. In the next game, another Illini recruit, Brandon Paul, took the floor for Warren Township in Gurnee against New Trier. Paul, who is a 6'2 junior, has pretty good skills now, and with another year of seasoning, should be a nice addition to the Fighting Illini family. New Trier has a 6'4 sophomore, Alex Rossi, who the Illini are looking at. Assistant coaches Wayne McClain, Gary Nottingham and Jerrance Howard were all milling around during this game, watching the action. What impressed me in this game was not Paul or Rossi, but the outside shooting of guard Jack Boehm of New Trier. Don't get me wrong, Paul looked good, but this Boehm kid was lights out for the Trevians. Boehm, who plays along with his twin brother Peter, had 13 points at the half, and finished with 27 points. Brandon did get things going in the fourth quarter, and at the end of the first half, he banked in a shot that was estimated at about 55 feet at the buzzer. I mentioned earlier that there were a lot of Illini fans in attendance, and orange was present all over the Assembly Hall. The next game featured even more orange, as the Peoria Manual Rams took on the Waukegan Bulldogs and yet another recruit for Weber, 6'6 sophomore Jereme Richmond. Richmond was the player that indicated interest in Illinois before his freshman year. Richmond is quite a player, and if he works on his game, he should be quite a player when he hits the collegiate ranks. Not forgotten by any stretch of the imagination is the football team, who continues its preparation for the Rose Bowl in Pasadena, California on New Year's Day. The Illini, who finished the regular season at 9-3 overall, are the only team to be in the BCS with 3 losses. This fact is not getting them much love from the national media, which is not surprising. And, to some extent, can you blame them? After all, this is a team that won just 4 games in the past 2 seasons, and here they reel off 5 straight to elevate themselves to the upper echelon of the Big Ten standings. I'm sure they would like to have the Iowa and Michigan games back, because this could be an even greater story if that were the case. Ron Zook, who grew up in Ohio, always dreamed of coaching in the Rose Bowl, but until this year, had never been given the opportunity to do so. Zook credits the dedication of the upperclassmen for persevering through some bleak times to get over the hump. But, emphatic as he is on the topic, insists that they still are not where they need to be. The number and quality of recruits that he is bringing in shows proof of that. The bar has been set higher, and the Illini will strive to get over that bar next season. They will finish up practice this week and then the team will spend Christmas with their families before re-convening after the holidays to fly out towards California on Christmas night. Regardless of the outcome, this is the feel good story of the year in Illini athletics and Illini Nation should enjoy the ride that this team is giving them. While the basketball team was idle for 9 days for final exams, it gave them a chance to regroup and focus on the task at hand, which is winning ballgames. So far in the 2007-08 campaign, the Illini have only taken the Assembly Hall floor for 2 regular season games, but that is set to change in the next couple of weeks, as the Illini play 6 of their next 7 games at home. The barrage of home cooking begins on Monday night, when the Catamounts of Western Carolina come to visit (7:00 pm Central time, Big Ten Network), followed by a Thursday evening tilt against Miami of Ohio (6:00 pm, Central time, BTN). Then, the Illini are off to St. Louis to play in the annual Busch Braggin' Rights game against Missouri at the ScottTrade Center. With the flurry of activity upcoming, Coach Weber hopes that this will give his guys some continuity, despite playing only 1 game in the past 2 weeks. Senior Shaun Pruitt is coming off a career high in points with 24 in the loss to Arizona back on December 8, and for the Illini to become a team to be reckoned with in the Big Ten Conference, they will need more of the same from Pruitt, as well as veterans Brian Randle and Chester Frazier. Randle is once again battling the injury bug, and Frazier needs to find his shot once again. The Illini enter play with the Catamounts at 5-3 overall. Rewind a little bit with me for a minute to October 22, 2005, a night that Ron Zook would love to forget. The scene is Memorial Stadium at halftime of a game that Penn State is running away with 56-3. After the Marching Illini and Chief Illiniwek exits the field, there is a mass exodus out of the stadium, as the crowd has seen enough. Coach Zook told his team that night that it was the lowest point of his coaching career, and this would be the worst that it would ever get for the players on the field that night. Zook later said that Penn State "took everything but the equipment" that night, but something else happened that night, unbeknownst to everyone but perhaps the coaching staff. It was that evening that Juice Williams and Vontae Davis committed to the Illini, and Chris James was persuaded to jump on board as well. It seems hard to believe that just a little over two years later, Zook has his team preparing to play in the Rose Bowl, the "granddaddy of them all". Yes, there are people out there that believe that the Illini sneaked in the back door to the BCS, and those are the same people that are clamoring a playoff system like the one that the FCS, or the old Division 1-AA uses. Still, it is Illinois that will be matching up against the USC Trojans on New Year's Day, a true matchup of Big Ten vs. Pac-10, the way the Rose Bowl was set up to be. 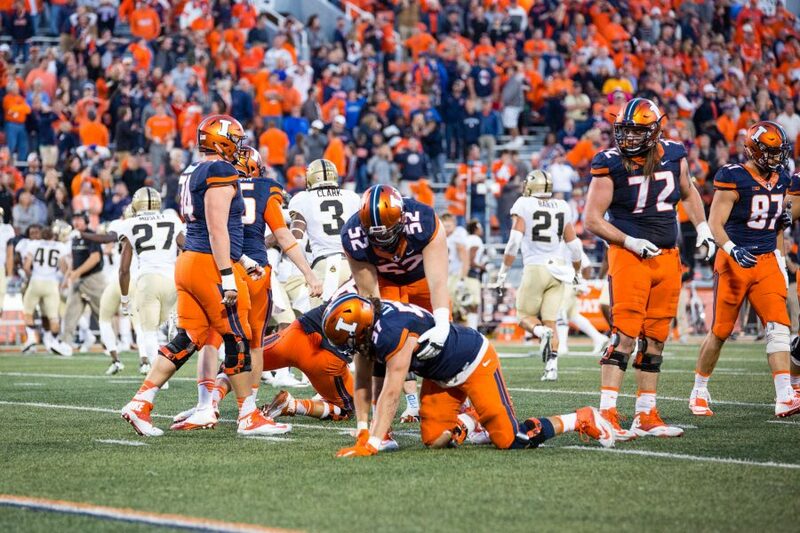 This year's team has been besieged with awards, and they continue well into the layoff leading up to the most anticipated football game that Illinois has played in many years. I believe this even foreshadows the Sugar Bowl back in 2001, mainly because it has been 24 years since the Illini have played in Pasadena. As the Illini continue to get ready for the Men of Troy, the recruiting continues to shine. The number of recruits totals 24 as of Tuesday, with A. J. Jenkins the latest to give a commitment. Jenkins is a receiver that will complement Arrelious Benn very nicely. What makes this one especially sweet is that we beat out Florida for A.J. 's services. With the high level of recruits coming in for next year, it seems a good bet that the Illini will be very much in the national title hunt. So what do you think? Did Illinois sneak their way into the BCS? I would be interested in hearing what everyone has to say on this. What a difference a year makes for Bruce Weber and his Illini basketball team. If last Saturday's game against Arizona at the United Center is any indication of how this season will go, then it might be a long year for Weber and his crew. The Illini were defeated by the Wildcats 78-72 in overtime, and once again, it is a game that for all intensive purposes should have gone in the win column. The Illini started off really well, getting out to a quick 12-0 lead. However, free throw shooting has been a concern for the Illini over the past couple of seasons, and it pretty much cost them the game against the Wildcats. That and the erratic play of Chester Frazier, who seems like he is winging shots with reckless abandon, not knowing where they will end up. Shaun Pruitt, who was listed as questionable with an ankle injury, ended up playing and had the game of his career, scoring a personal high of 24 points on 10-11 from the field. The level of play needs to step up for the Illini, who fell to 5-3 with the loss. The 3 losses on the season are all to formidable opponents, but they need quality wins to boost their NCAA Tournament resume, right now void of a such victory. The Illini get to hit the books this week as final exams invade the campus. Then, next week it is a busy one, with games at home against Western Carolina and Miami of Ohio, then the annual Border War game against Missouri on December 22. Hopefully the rumblings about Weber and the Illini won't get too loud to ruin anybody's holiday. So, I pose this question to all of you readers out there. What do you think of the Illini basketball team this year? Do you think they are an NCAA tourney team at this point? Please let me know what you think. Smell The Roses, Illini Nation!!! The speculation is over, so let the journey begin! The Fighting Illini football team found out on Sunday evening that they will be heading to California for the holidays to play in the Rose Bowl Game, presented by Citi. Thought to be a glimmer of hope as late as two weeks ago, things just started to magically fall in place, and the Illini were being mentioned for BCS inclusion. Then, on Saturday, the unthinkable happened. For the Illini to be considered for Pasadena, three outcomes needed to occur. First, Boston College needed to lose to Virginia Tech, which happened. Next, West Virginia needed to be defeated by Pitt, which also took place. Finally, the Illini needed Oklahoma to defeat Missouri in the Big 12 Championship game, which would more than likely put Ohio State in the national title game on January 7th. The Sooners were able to get the job done, and all that was really left was the official announcement, which was handed down on Sunday evening. It has been 24 years since the Illini have played in the Rose Bowl, and the last visit wasn't very memorable. The Illini were defeated by UCLA 45-9, and it wasn't much of a contest from what I remember. This time around, the Illini will be facing Southern Cal, who is one of the better teams in the country and is playing that way. In a telephone interview on Sunday evening, Ron Zook was asked about the Trojans and he simply stated that "you want to have a chance to go against one of the nation's best, and we will get that chance, because USC is one of the best teams in the country". Aside from the fact that the Trojans play just minutes from the Rose Bowl gives them an edge right from the start. However, Zook thinks that there will be plenty of Illini orange in the stands, given the strong alumni representation in Southern California. This is a remarkable story, mainly because it has taken Zook just 3 years to turn this program around and now has them in a BCS bowl for the first time since 2001. The seniors on the football team deserve this, and I am very happy for them. Now the fun begins, with alumni and season ticket holders trying to scrounge to get tickets for the game. The university will get an allotment of 25,000 tickets, which probably will get snapped up rather quickly. Then, add to the fact that airfare and hotel accomodations will not be cheap, puts the average fan to watching it on television. However, the diehards will find a way to get there, even if it breaks the bank for them. This is a once in a lifetime opportunity for most, and having been at the last BCS appearance for the Illini in New Orleans on New Year's Day 2002, I know the feeling. Sadly, I'll be sitting this one out, for reasons that I have already talked about in previous blog entries. I will, however, be covering as much as I can in the weeks that lead up to the game itself. As always, I welcome you comments and questions, football, or anything Illini.